On Friday, April 8, between Novye Cheryomushky and Kaluzhskaya subway stations in Moscow, an elderly man fired a trauma pistol several times into the head of a man of non-Slavic appearance. The wounded man is now in the intensive care ward of City Clinic Hospital No. 1 in serious condition. The Civic Assistance Committee has taken charge of the victim’s legal defense. On the evening of Friday, April 8, Sulaimon Saidov, a 38-year-old Tajik national, was traveling home from work to Tyoply Stan. He was accompanied by his 19-year-old nephew Mukhammajon Khakimov, who had recently arrived in Moscow from Tajikistan. Saidov has lived in Moscow for over thirteen years. Like most of his relatives, with whom he rents a small flat in Tyoply Stan, he works in construction. The job enables Saidov to feed his four children. This time, the trip home on the subway proved disastrous. It all began quite casually. At Profsoyuznaya station, a drunken middle-aged man who could barely stand on his feet burst into the subway car. He immediately spotted Khakimov. He went right up to him, pushing him and shouting. “Who the hell are you? Where are you from? What are you doing here?” he asked Khakimov. Khakimov modestly replied he was from Tajikistan. The assailant called Tajiks “black monkeys,” swore, and demanded that uncle and nephew immediately leave the car because it was “only for [ethnic] Russians.” Khakimov went over to his uncle, seeking protection. Saidov stood up, pushed his frightened nephew behind him, and tried to calm him. “The man is just drunk. Don’t look at him. Don’t pay any attention,” he said. As Saidov relates it, he felt no danger: the threat from the elderly, frail-looking man seemed too absurd. Even when he spotted a pistol in the assailant’s hands, he did not believe it. He thought it was a toy. However, the pistol was real, a trauma pistol, and the assailant began firing. He managed to squeeze off several shots at both Tajiks. He missed Khakimov, but he hit Saidov three times in the head and once in the stomach. At short range, the shots could have been deadly. One of the bullets entered Saidov’s eye and damaged the sclera, while another left a huge wound in his skull. Saidov realized he had to fight for his life. He felt no pain. In a state of shock, he grabbed for the assailant’s pistol and managed to wrest it from his hands. At that moment, the doors of the subway car opened, and assailant and victim found themselves on the platform of Kaluzhskaya subway station. According to police, there was no CCTV camera in the car, but on the station’s cameras what happened looks like a fight. Rushing to the scene, police detained the man holding the pistol: Saidov. Police grabbed him, wrested the weapon from him, and put his hands behind his back. Only when bystanders shouted that he was the victim was Saidov released. The assailant managed to escape the scene, but was detained quite soon thereafter. When witnesses identified the attacker on video surveillance recordings at the station, it turned out the man’s face was familiar to police. After the pistol was fingerprinted, there could be no doubt: the assailant was 58-year-old local resident Sergei Tsaryov, who had been detained at the same subway station a week earlier. Tsaryov was brought in literally minutes later. However, police were unable to talk with him for a long time. The man was so drunk he could not answer clearly. At the same time, relatives of the victim were giving testimony in another office. Saidov was almost immediately taken away by ambulance. His injuries were so severe that doctors feared for his life. Saidov’s cousin Dilshod Saidov, who speaks Russian well, soon arrived at the scene. At the time, Police Captain Ilyinsky was questioning relatives and witnesses, and drawing up an incident report. Dilshod Saidov assisted the captain by translating for Khakimov. But when Ilyinsky read the interview record aloud, Saidov was struck by the differences between it and Khakimov’s testimony. Saidov began verifying the interview record phrase by phrase. According to the text, it was Khakimov who had got a rise out of the passenger with whom Sulaimon Saidov had later fought. 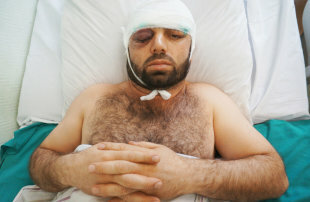 But most importantly, the ambulance doctors managed to get Sulaimon Saidov to City Hospital No. 1 quickly, where he immediately underwent surgery. Thanks to the efficiency and professionalism of his doctors, Saidov survived. Saidov’s family are alsop grateful to a young female witness who went with them to the police station and stayed there to the end. Unfortunately, they were unable to exchange telephone numbers. The police were vigilant and made sure that communication between them was impossible. Saidov’s relatives stood watch outside the intensive care ward all through the evening of April 8 and the early hours of April 9. The doctors are now optimistic in their prognoses. Although Saidov suffered a severe bruise to the crown of his head, the brain was not affected. Saidov remembers everything perfectly, and has no problems speaking. The biggest worry is his eye, but the doctors hope to be able to save it despite the damage to the sclera. Perhaps another operation, a more expensive one, will be necessary. The Civic Assistance Committee plans on announcing a fundraiser for Saidov when details have become clear and his relatives have received the necessary medical documents. The Civic Assistance Committee is defending the interests of the victim, Sulaimon Saidov, in the case. Representing the victim will be Filipp Shishov, an attorney for Memorial Human Rights Center’s Migration and Law Network. Shishov previously represented Maratbek Eshankulov, the young man who unable to return home for four years because of the “dissimilar” photograph in his passport.